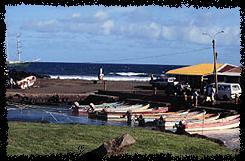 Hanga Roa is the only town on Easter Island. Most of the 2,000 Rapanui people that live on the island reside here. The only port on the island is situated here, as is Cook's Bay, where Captain Cook anchored his boat just offshore in 1722. (above) Panoramic view of Hanga Roa.